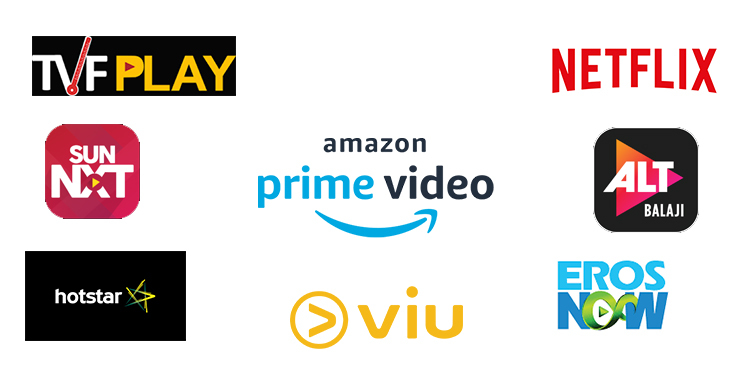 Mumbai : The recent survey conducted by Velocity MR, reveals that Indian consumers more than 70% watch Amazon Prime regularly, at least once a week. This trend that is picking up is possibly due to the bundling offers that Amazon provides its customers and availability of more Indian content. The leading OTT player is followed by Star India’s OTT platform Hotstar that claims of 60% of Indian consumers watching it weekly while the independent online streaming platform, Netflix is being watched by 56% of Indian consumers weekly. Viacom18’s OTT platform Voot stands in the 4th place as its watched by 28% of Indian consumers, while Eros International’s platform Eros Now is being watch by 17% atleast once a week. Independent online streaming platforms like Balaji Telefilms owned ALT Balaji and PCCW owned Viu claim to have a viewership of 13% and 9% respectively. The regional player Sun NXT has garnered 7% of viewership while TVF’s TVF Play claims 6% viewership of Indian consumers. Other OTT players constitute 3% the viewership of the India consumer as per the study. The study also gives us a broader view on Consumer Opinion on Various Content, that reports, Online web series and TV series are gaining popularity over TV soaps & reality shows. Interestingly Indian consumers below the age group of 35 years tend to prefer Online web series” followed by “TV series”. Further, TV soaps & reality shows are preferred by people below above the age group. Online web series Sacred Games that streamed on Netflix and Amazon’s web series Breathe are discovered as the most entertaining web series by 61% of the consumers in India TV series like Suit, Quantico, and Sherlock Holmes are voted the most entertaining TV series by 58% of the consumers according to the report. However, 52% of the people find TV soaps & Reality Show entertaining. Diving further deep into the most Most Watched TV and Online Series, it is observed that Game of Thrones on HBO with 49% of consumers watching is the most watched International TV series in India, followed by Friends with 42%, Sherlock Holmes with 36% and Big Bang Theory with 35% of viewership. Mirzapur on Amazon scores 50% of viewership as the most watched Indian Online series closely followed by Netflix’s Sacred Games with 46% of viewership. 32% of Indian consumers say that they watch Stranger Things while 22% of them watch 13 Reasons Why. Other series like Selection Day and The Walking Dead claim to having watched by 17% of the consumer each. 15 % of the consumers say that they do not watch any web series. The study by Velocity MR gives us some very useful insights on the viewership pattern , in which its is seen that more than one-third of the people in the Top Indian Metros watch TV or Videos Online for 1-2 hours daily, while close to 25% watch 2-4 hours every day. Around 20% of consumers reveal that they watch TV or Videos Online for 30 mins to an hour, while 13% of people spend more than 4 hours of time, and only 7% says that they spend less than 30 mins watching TV or Videos Online daily. Additionally the study reveals us on the source of news, which states TV stays as the source of new for 79% of consumers, while close to 65% get their news from Social networking sites and print media each. Google news/Yahoo news/ Rediff news happens to be the source of news for 59 % of consumers while Apps/Website/ m-site of Newspapers like TOI/ HT supply news to 52% of consumers. Inshorts the news app is the source news to 20% of the consumers while 17% of consumers source their news from Newsletters in email from the subscribed news websites. In a nutshell it is observed that Among those who feel that they are currently charged more as per the TRAI’s new rule, majority prefer to opt for lesser number of TV channels or shift to online streaming or OTT platforms such as Netflix, Amazon Prime etc. And if the channels are bundled as a package consumers prefer them the most rather than getting only basic regional channels ‘Best Fit Plan’ for a minimum subscription or a paying for each & every channel.